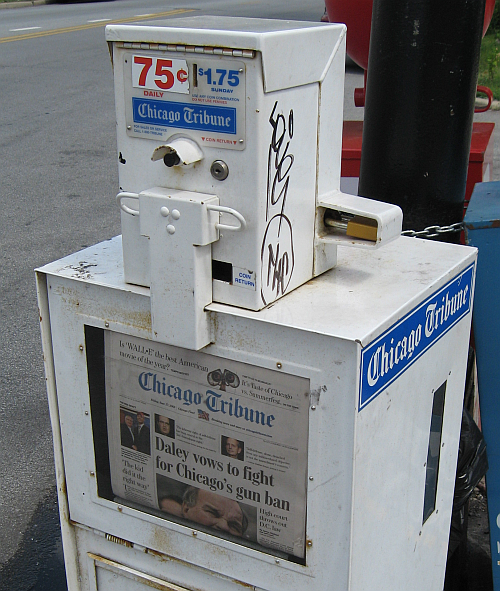 I started writing this post about the Chicago gun turn-in program in the summer of 2007, but quickly realized I would never be able to to describe it adequately and abandoned the effort. Now I am putting online what I wrote back then, remembering my first visit to Operation Push, the sweltering room, the whisper that went through the crowd when the Rev. 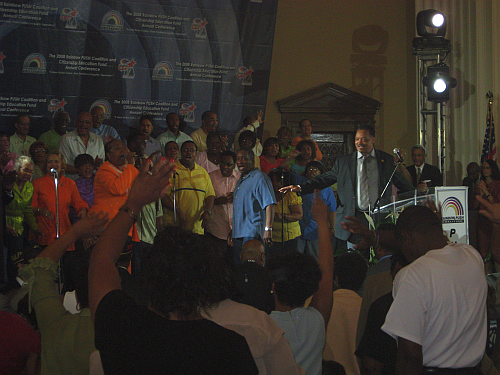 Jesse Jackson appeared at the back of the stage, and the bravery of the two parents standing on either side of Rev. Jackson, parents of a teenage girl who had been killed the day before, a child killed by another child with a gun while eating lunch at a fast food drive-in. 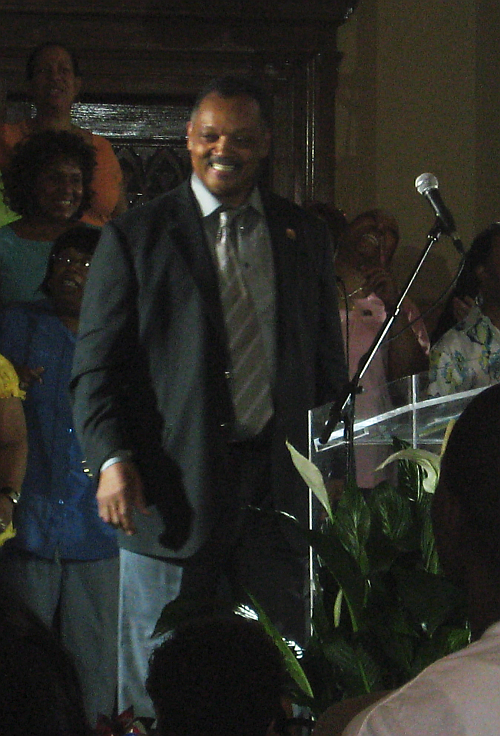 When I got out of bed this morning I never dreamed I’d be singing “We Shall Overcome” with the Reverend Jesse Jackson today. It started out as an effort to support our school president who was making a speech promoting the school. 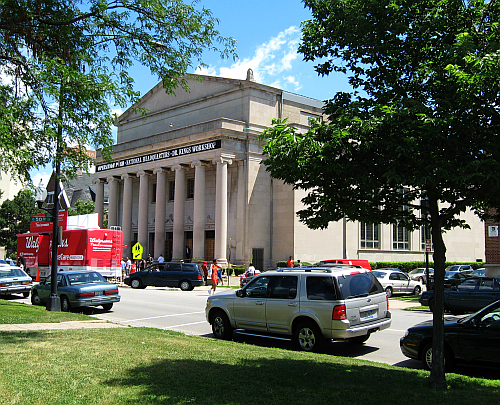 Lured by a promise of free coffee and donuts, I ended up in Hyde Park at the Operation Push headquarters, where after a warmup by the choir, the Reverend Jackson himself appeared on stage. It was the first time I had been inside the building. 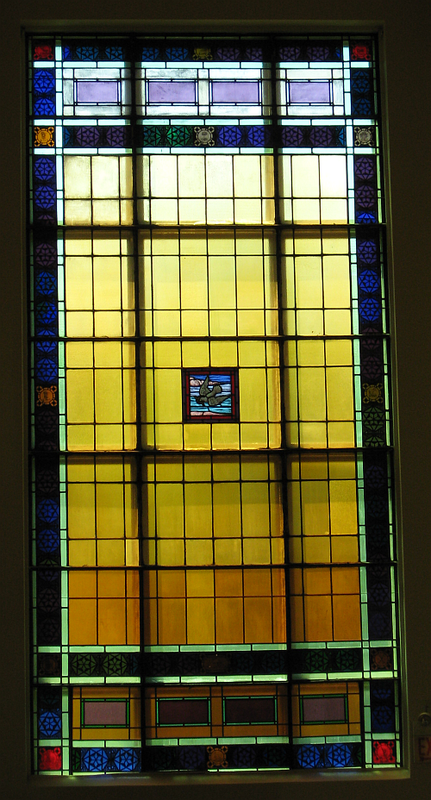 Hebrew letters in the stained glass windows and a star of David at the very top of the stage attest the building’s former incarnation as a synagogue. In front of the stage was a light blue coffin. On either side of the coffin, Chicago police were stacking semi-automatic weapons that had been turned in as part of a program to get weapons off the street. For the rest, one picture is worth a thousand words. Rev. Jackson started out speaking normally, but no one listened. I couldn’t figure it out. When someone starts speaking, I’m used to listening quietly, but not this crowd. Quickly Rev. Jackson started a call and response type of speaking, one short phrase then another, the crowd shouting each phrase back to him. Posted in Illinois. 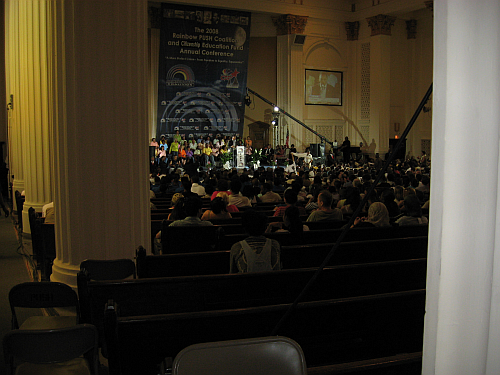 Comments Off on We shall overcome.